Most companies spend huge budgets creating content to get people to sign up to their product. But once a customer signs up, it’s left to a handful of badly written FAQs to help people get the most from the product. It’s no wonder up to 60% of users who sign up for a free trial use a product once and never come back. At Intercom, we believe that providing educational and motivational help content leads to loyal and engaged users. So instead of giving customers a series of boring how-tos, we create best practice content. Think connected strategies that help users get the most from your product, not isolated how-tos. We work hard to uncover real-life examples, expert tips and insider secrets so that our customers don’t have to. If you’re not helping to educate your customers, you’re giving your competitors a chance to fill in the gaps. Here’s five lessons we’ve learned for creating best practice content. Most help content is siloed. It gives you the answer to one question, but sends you elsewhere to find the next. Instead you should write help content that addresses the entire job your customer wants to do. Don’t force them to waste valuable time searching for answers. For example, our support best practices article outlines a complete strategy for how to provide personalized customer support. It’s not just a series of FAQs. Design a series of quick wins. Break up tasks into small bite-sized paragraphs. Prioritize the easiest step first. Giving your customers a quick win will whet their appetite for another. Let them scan. Use bullet points, sub-headings, whitespace and screenshots for easy skimming. Let them watch. Embed a how-to video within your doc for a speedier lesson. Link to how-tos. Instead of making a feature the main focus of your article, mention it briefly, explain the job it does, include a screenshot, and link off to a how-to article. Almost all the examples that we use in our help content are taken directly from our customers. That means actually talking to them and listening to their stories. When a customer runs into trouble, they’ll have real-life examples, not abstract use cases they can’t relate to. When we created our Events best practice guide, we could have provided boring step-by-step instructions on how to use the feature. “Click here to filter your user list”. Instead, we pulled the data that showed us the types of Events people created most in Intercom, and built sample use cases around it. 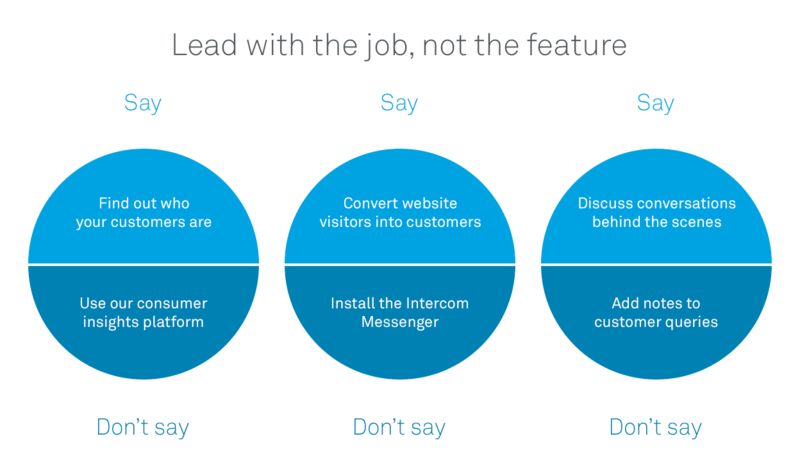 Knowing what customers use Intercom for lets us build better content to support them. Sit in on sales calls to find out what your customers want to achieve with your product. Get your Customer Support team to record common queries they get about your product. Include examples from your existing customer stories, especially those that show impressive results. Listen to the words customers use. When you write, use the same phrases. You’re an expert on your product. And chances are your team are using it in creative ways. But have you shared that knowledge with your customers? 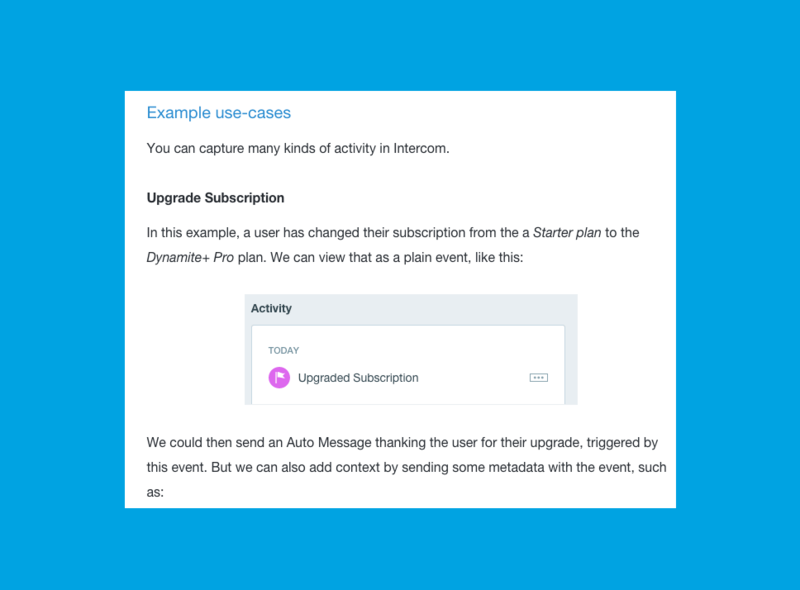 When we created a guide for announcing new features, we interviewed our Product Marketing team about how they used Intercom to launch a feature. Getting first-hand experiences from the experts of today can help you create valuable content for the experts of tomorrow. We’re constantly annoying our colleagues with questions like, “Why did we build this feature?”, “How do we use it?”, “Do we have any real-life screenshots we can showcase?”. The quality of your advice to your customers depends entirely on what you’ve learned about your product’s capabilities. And as your product and company keeps growing, that means continually seeking out new material to support your customers. There’s usually a huge disconnect between the language used in help content and the language customers actually use. You’ll find the simplest, clearest words work best. That doesn’t mean you should talk down to your users – no one likes being patronized. It means translating your product’s concepts into customer friendly language, so they don’t have to. Write with confidence. Use active language instead of the passive voice. Choose strong words like ‘should’ and ‘need to.’ The more confident your tone, the more your customers will believe in your advice. Have fun. The more excited you feel while writing, the more motivated your customers will be to learn and progress. Your customers are more familiar with the job they’re trying to achieve, not the terminology of your product. Your knowledge base is a living entity, just like your product. Once an article is published, don’t let it grow stale. Just like you iterate on your product, revisit articles often and look for opportunities to offer more value. A freshly shipped feature could make a useful next step for an older article, or a recently published customer story could make an epic new use case. The best way to ensure your content remains fresh is to make sure you’ve got open feedback channels across the company. At Intercom, everyone gets a look in – from the product team, to our engineers, and of course, our customers. These feedback loops are essential to producing quality educational content. It means each article is checked for clarity, technical accuracy and potential customer issues. Let your writer’s ego take a back seat, and get input from people across the company. Never underestimate the value of teaching customers a better way to use your product. The better they are, the more likely they are to become long-term, loyal customers. As onboarding and marketing expert Samuel Hulick says, “People don’t buy products; they buy better versions of themselves.” So give your customers what they’ve signed up for – a way to excel.